This recipe is sponsored by Divine Chocolate as part of #Choctoberfest. All opinions are my own. 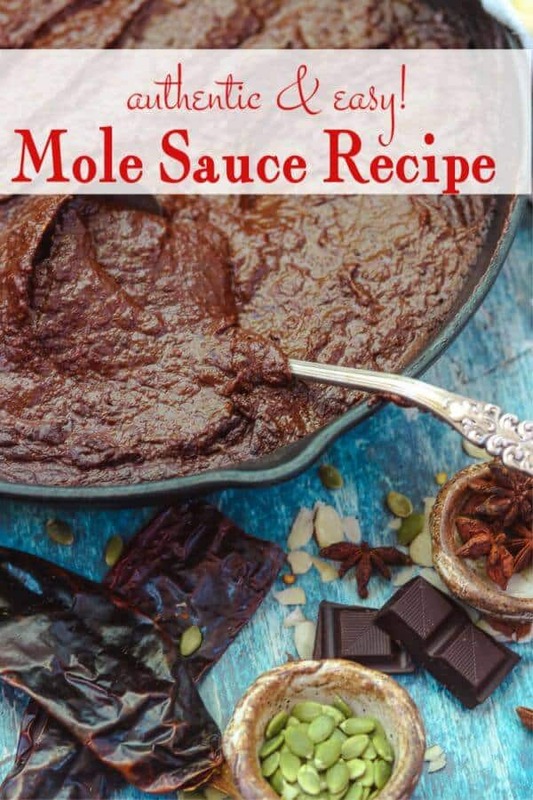 This easy mole poblano sauce recipe joyously exalts all of the delicious flavors in authentic Mexican mole sauce. Unlike the traditional version, this is done in about 30 minutes but it has all the flavor and texture of your Abuela’s secret recipe. Use it on enchiladas, chicken, burritos, tacos, and more! Describing a good mole sauce (pronounced moh-LAY) is like describing Dvorak’s New World Symphony. There are hundreds of layers of flavor starting with succulent and ending with sweet heat…the texture is rich and velvety, but hearty and satisfying at the same time. Complex doesn’t begin to describe this versatile south of the border mole recipe made with the darkest of dark chocolates. There are a lot of ingredients but this homemade Mexican condiment really does go together easily. Living in Texas means that I’ve had my share of Mexican food, good AND bad. I’ve been to 5 star, authentic Mexican restaurants and yummy little holes in the wall but I’ve never found a mole sauce that I liked better than this one… and I didn’t even have this one in Texas. I was in Salt Lake City, Utah for a conference and after the second day my friend and I decided to head to a little Vietnamese place that we’d read about on Yelp. We called for an Uber and sank into the back seats, giving the driver the address. Exhausted doesn’t begin to describe how we felt! We chatted with the driver on the way and soon were at the Vietnamese place… which looked kinda seedy and a little scary. He smiled and told us about Red Iguana. We settled back in the seat and were on our way. So, at Red Iguana we both had mole but different types. I went with a classic mole poblano over turkey and I was totally hooked. I knew that I was going to recreate this mole recipe for #Choctoberfest! Good mole sauce starts with a variety of dried chiles and a good quality chocolate. Follow these step by step images to see how it’s transformed into a mouthwatering mole! Oil – You can use any kind of light oil you prefer. I use peanut oil since no one in our family has allergies. A variety of dried chiles – I’ve linked to the chiles that I used in the recipe but you can adjust the flavor by adjusting the amounts and types of chiles you use. This comes with experience and practice. Garlic – Whole, fresh garlic will result in the best flavor. Whole cloves (the spice) – I prefer the flavor in whole cloves but you can use 1/4 teaspoon of ground cloves if you like. Star anise – Even if you don’t like the flavor of anise try it just once. It just makes this sauce perfect. Tortilla chips – These are used for flavor and texture. Use your favorite. Diced tomatoes with chiles – I use Ro*Tel but use what you have available. Onion– Either yellow or white onion is fine. Raisins– Raisins add natural sweetness and texture. Pumpkin seeds – Help to thicken the sauce and add texture. Almonds– Help to thicken the sauce and add texture. Sesame seed – Add texture. Bananas – Add sweetness and thicken the sauce. Ground cinnamon – I prefer Vietnamese cinnamon but you can use whatever kind you like. Chicken stock – Homemade is best but I buy it a lot of the time because it’s just easier. Use a good, flavorful stock. Divine Chocolate 100% Chocolate Bar – This is usually called baking chocolate and it’s not sweet at all. Chili powder – I use my homemade chili powder (link in the recipe) but your favorite store brand is fine. Brown sugar – I prefer dark brown sugar over golden brown for this recipe. Skill: Easy – anyone can make this! What is mole sauce made out of? Mole sauce is made from 20 or more ingredients which always include dried chiles and chocolate. There are several different varieties and each variety has numerous variations depending on who’s doing the cooking! How do I make mole sauce? It’s a very easy recipe even though there are so many ingredients. >>Saute the chiles and dry ingredients in a heavy frying pan – a cast iron skillet is great. >>Add the wet ingredients and simmer, adding chicken stock as necessary. >>When all the ingredients are soft puree them in a blender. 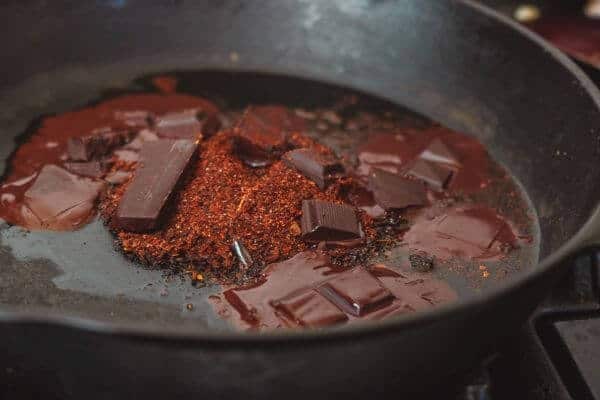 >>Melt the chocolate and chili powder together over medium heat and stir until smooth. >>Add the puree to the chocolate mixture, bring to a boil, and adjust seasonings. >>Simmer until thickened and smooth. It’s best if it sits overnight in the refrigerator. How long does it take to make mole sauce? Traditionally mole is simmered slowly over low heat but this mole poblano takes less than an hour. What does mole sauce taste like? Ummm… Heaven? Mole is spicy and fruity, with meaty undertones. The chocolate softens the flavors of the peppers and brings everything together. It doesn’t taste like a candy bar! What is mole used for? It’s often served over chicken or turkey – it’s a great way to use up leftover Thanksgiving turkey! Sometimes mole is used as a sauce for enchiladas. 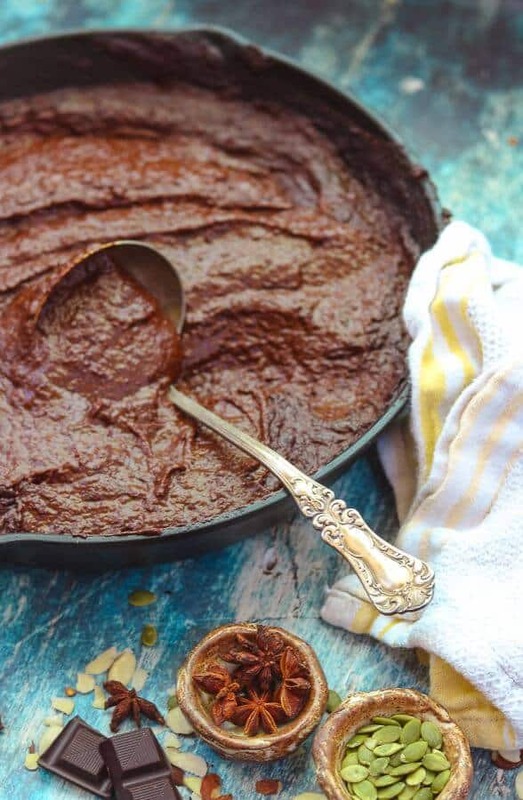 Refrigerate the mole sauce overnight before using for the best flavor. 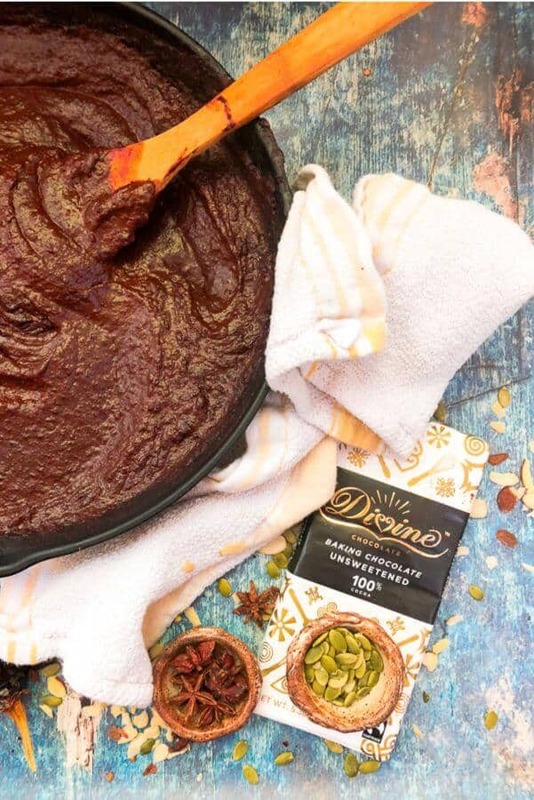 Divine Chocolate US provided the chocolate for this mole sauce recipe. Their cocoa is grown on family farms in Ghana and is Fair Trade. In fact, those family farmers own 44% of the company and share in the profits. I was super impressed with this because of my personal convictions so I went to the website to read more. In a cocoa shell (get it? cocoa shell? in a nut shell? in a cocoa shell? never-mind) there is a minimum Fair Trade price guarantee of $2000 per ton to protect farmers from the ups and downs of the market. On top of that the cooperative receives an additional $200 per ton to invest in projects that improve the farmers’ living conditions, health, and education as well as productivity. A percentage of the price of each Divine chocolate goes towards producer support and development which is spend on farmer education and maintaining the vision of the cooperative. The cooperative ALSO has two places on the Board so it can have a part in how Divine is developed. And that’s all awesome but there’s more. Divine is empowering women farmers in a largely male dominated field by giving them equal opportunities to training, the ability to increase income, and with that increase – the financial security to keep their daughters in school. The 100% chocolate bar that I used in this mole is smooth and full of dark chocolate flavor. You can see how creamily it melted… and it’s vegan! 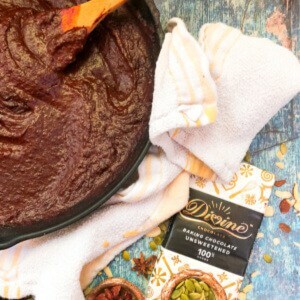 Divine Chocolate 100% chocolate melts beautifully in this mole! Since Mexican food is one of my favorites I have a ton of recipes for you to try! Here are some of my favorites. This authentic mole sauce is so good. It makes about a quart and a half and it freezes well. Try some over leftover turkey after Thanksgiving – SO good! This easy, mole sauce recipe is spicy and complex. So easy to make fresh mole from scratch! Use it over chicken, turkey, or pork. Freeze leftovers for another time. In a heavy (cast iron is best) frying pan heat 2 tablespoons of oil over medium heat. Add the chopped dried chiles, garlic, cloves, pumpkin seeds, almonds, sesame seeds, and tortilla chips. Cook for 5 minutes, or until chiles are softened and begin to brown. Don’t scorch the garlic! Add the tomatoes, onion, raisins, bananas, cinnamon, and 1 cup of chicken stock. Simmer for 20 minutes or so, adding more stock as needed, until all the ingredients are soft. Place in a blender, about 2 cups at a time, and puree adding chicken stock as needed until the mole is a smooth, thick paste. Heat the remaining two tablespoons oil over medium heat. Add the chili powder and the chocolate. 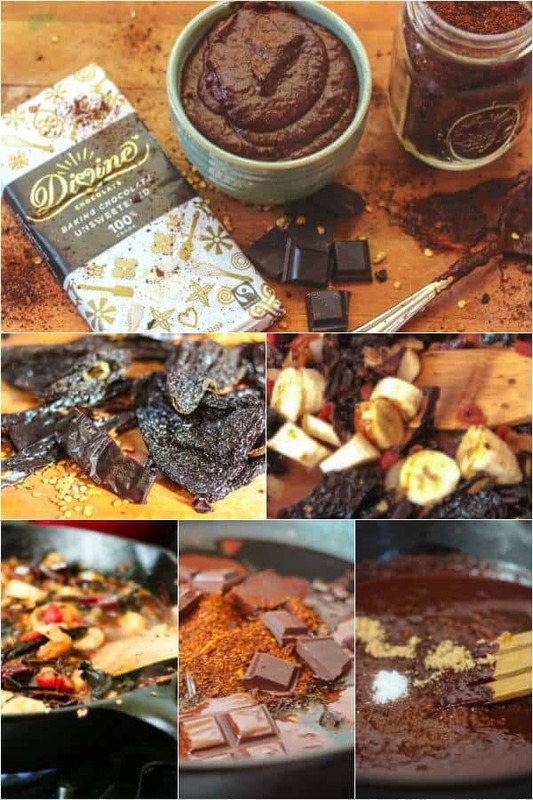 Cook, stirring constantly, until chocolate and chili are melted together and smooth – be careful not to scorch! Stir the pureed mixture into the chocolate mixture. Bring to a boil, adding more chicken stock as needed to reach desired consistency. Use any combination of dried chiles that you like and are available in your area. 1st off: I hate reviews from folks who haven’t tried the recipe, However I MUST say that this is a miracle find!!! I absolutely fell in love with mole after eating it at The RED IGUANA in Salt Lake City. Btw, I live in Ft Lauderdale!! Only ate there once and have been exploring mole recipes ever since, 11 years !!! Not sure this is the one I tried, but I’m willing to try this recipe. I absolutely harassed the waiter about the sauce until I could understand his accent as “almond mole.” Can’t wait to try it, as it may be a long time until I go back to the Red Iguana!